One chemical company used to proclaim "better living through chemistry." But at what cost? That chemistry, those chemicals may be helpful, but they may also be dangerous. Host Dan Ringer and special guest Professor Patrick McGinley of the WVU College of Law will discuss the transport, storage, and control of chemicals, on this episode of The Law Works. 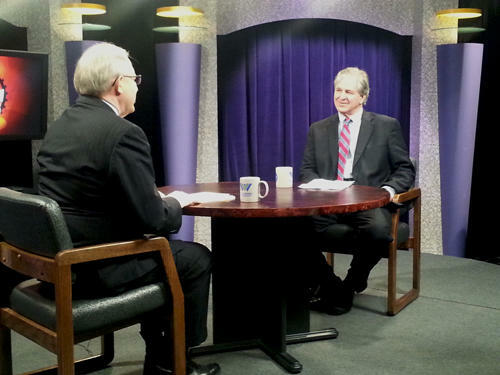 This program airs February 6 at 8:30 p.m. on West Virginia PBS and is rebroadcast on WV PBS.2 on February 7 at 11 a.m.
(L-R) The Law Works Host Dan Ringer with Prof. Patrick C. McGinley, WVU College of Law.